Wow! This week had gone by in a blur! But it has, generally, been a really good week. During the day at least. The nights have been a whole other story! Read on to find out why in this week’s Living Arrows! I mentioned in last weeks Living Arrows that Isla hadn’t slept well last weekend once we got back from camping. Well, that has continued for the rest of this week too! We are pretty much like zombies in this house at the moment. We’ve been to two groups this week. I was quite impressed with myself! On Tuesday we mostly went because I wanted to get her weighed (9.1kg/20lb if you were interested) and then stayed to play until it closed. We then also went on Friday morning as we were up and ready earlier than we usually are. There were lots of different children there compared to the usual group we go to, which I think Isla quite enjoyed. Turns out she really likes being pushed around in a Little Tikes car as well! Isla has been thoroughly spoilt as well this week, as we have been to two, yes TWO, new soft play centres. On Thursday we went to Odds Farm with friends. We saw some gorgeous baby piggies amongst other animals, and it has a really good play on their immense soft play area! I think Isla was in her element. So much room to run around as well! I think I’d love to have a go on the big slides they have there in the big kids area. And then on Saturday we went to Play Train which is 5 minutes down the road from us. One of our friends has mentioned it to us several times, so we thought we would try it out. Again it was really big, although the toddler’s section was a lot smaller than Odds Farm, and I think it being so close to the big kids section meant that Isla was a bit overwhelmed by them barging past her so often. I think she enjoyed that they had Little Tikes cars there though…including a princess/horse one!!! She also loves going on the big girls bike outside. She struggled to stay sitting on the seat and holding on to the handle bars as she wanted to, but LOVED ringing the bell on the bike! 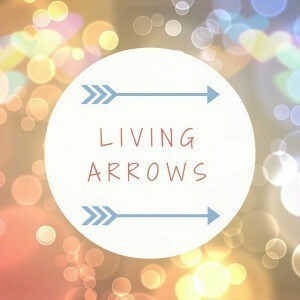 This weeks Living Arrows photo was taken on Saturday night. We try to water our garden most nights, particularly if it has been really hot, as the weather has been recently. Usually we do this once Isla is in bed, which often means late nights for us, and not sitting down to relax much at all. But on Saturday we decided to at least start it before dinner. Isla has recently started showing a lot of interest in what we’re doing in the garden, and has taken a shining to our watering cans…mostly she likes to try to eat them, but still! 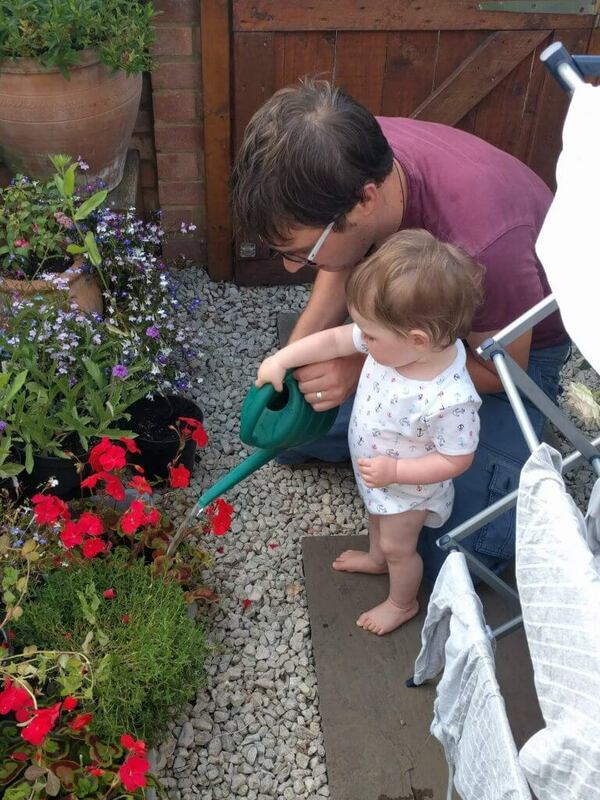 So we filled up the little one we had and Daddy helped her water some of the flowers. 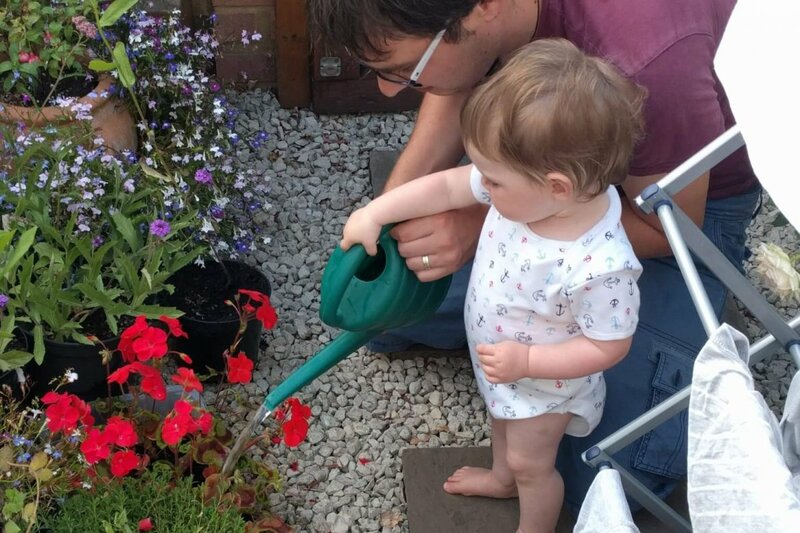 She absolutely loved it, and we kept having to fill the watering can up so she could carry on watering more flowers. Hopefully this is a sign of things to come, and Isla can start earning her keep round here!!! I really hate the teething stage! So tough! Arthur my youngest loved sucking on cucumber sticks though and i found that really helped!